Big Sky is a trail running paradise. Lace up your trail running shoes, grab your water, and go trail running in Big Sky. It's amazing out here. Big Sky has hundreds of miles of trails that snake through our mountainous backyard. There are trails that lead to distant summits, meander through alpine basins, weave through thick Montana forests, cruise across meadows covered in wildflowers, follow flowing streams and rivers, and roll along endless ridge lines. Pick a trail, any trail, and you'll have a good time. Millions of people go trail running every year. There's something magical about moving effortlessly through mountain terrain on trails covered in dirt, rock, or other natural features. Plus, the views you'll see while you're out and about are mind blowing! Uplands and Hummocks Trail - These two trails both start near Big Sky Town Center. Hummocks Trail is essentially three connected circles of trails that take you through forests, meadows, and wetlands. Add in a bit of elevation gain through a mountain meadow on Uplands Trail and you'll be one happy trail runner. Ousel Falls Trail - Perhaps Big Sky's most popular trail, Ousel Falls takes runners on a well maintained and wide trail that parallels the West Fork of the South Fork of the Gallatin River. The out and back trail ends at the scenic Ousel Falls. Beehive Basin Trail - If you're looking for a high alpine run, check out Beehive Basin. This higher elevation trail works through a series of meadows into a stunning alpine cirque of towering rock walls. 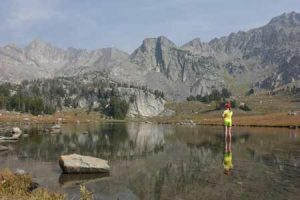 Spanish Peaks Loop - For a more adventurous run, start at Spanish Creek and head uphill to Beacon Point. Then drop down towards Summit Lake and follow Mirror Basin back to Spanish Creek. This loop starts and ends at the Spanish Creek Trailhead. 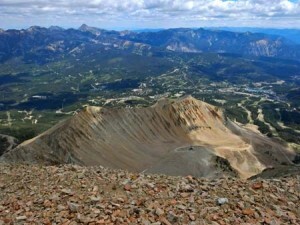 Spanish Peaks Traverse - This run will require a car shuttle. Start at Big Sky's North Fork Trailhead and run toward Bear Basin. From the pass, choose to go down Mirror Basin or up to Beacon Point and end at Spanish Creek. Lone Mountain - Perhaps the classic trail run in Big Sky begins at Big Sky Resort's Mountain Village at 7500' and heads to the summit of Lone Mountain at 11,166'. This trail run features broad ski runs, winding forest trails, scrambles across scree slopes, and running across exposed ridges. Plus, you get to tag the summit of Big Sky's most iconic mountain. Let these trails get your Big Sky trail running adventures started. Grab a trail running buddy. Fill up your water. Bring your bear spray. Go trail running in Big Sky, Montana. Oh and bring your dog too. Dogs love trail running. Be safe trail running in Big Sky and have fun!